Heat 1 tablespoon of the oil in a wok or large frying pan. Add the beaten egg and cook for 2-3 minutes, whisking gently with a fork as it starts to lightly scramble. Use a spatula to remove the egg from the pan and set aside. Add the remaining oil and gently fry the onion over a high heat for 2-3 minutes, until it starts to soften and turn golden. Reduce the heat and stir in the five spice paste. Allow to cook for 1 minute, stirring all the time. 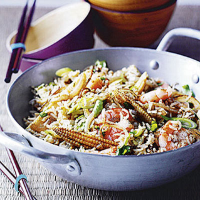 Add the baby corn and stir-fry for 3-4 minutes. Stir in the rice, three quarters of the salad onions, three quarters of the coriander, the prawns and the cooked egg, and allow to heat through for 1-2 minutes. Divide between serving bowls, garnish with the remaining salad onions and coriander. Serve straight away with a little soy sauce. For a really speedy supper, use two packs of ready-cooked 250g Waitrose Microwave Basmati Rice. Make chicken fried rice by replacing the prawns with 2 cooked chicken breasts, cut into bite-sized pieces.